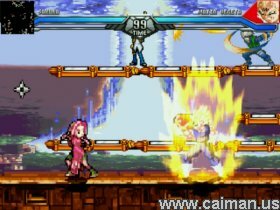 Caiman free games: Jump Hyperstars by Wounami. - 22 characters (Dragonball Z, Naruto, One Piece etc) + 3 hidden characters. 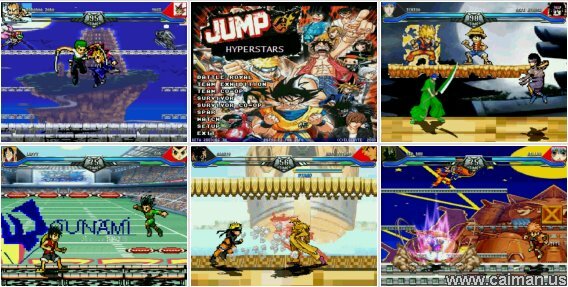 I return with a PC version of NDS Jump Superstars. 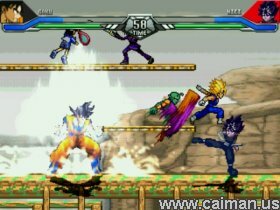 But this version plays in a hectic speed (when you play as Naruto on Battle/Simulation you'll understand what I mean) and with big sprited characters. I removed the Arcade mode to make the game more focused on it's Simulation (2P vs 2P) battle, so once you load up the game just press the down key twice to highlight Battle Royal.